There is still a lot of buzz on Linkedin about the role the photographer played in the NYC subway story, about the doomed man on the tracks. What do you do? Photograph, or save a life? Reading the LinkedIn discussions gave me faith in mankind. I can only hope that if I need help someday one of these contributors is close by. This question has bothered me an entire lifetime. I had actually forgotten about it- until this story and image appeared on the cover of the New York Post. What does one do when faced with a horrible decision? As a photographer, I too was holding a camera while holding onto my daughter-who was standing on a fence overlooking the bears-when I was asked this question. At the time, I was really angry that she even posed such a dreadful scenario. “Of course I’d jump in,” I said as I thought long and hard about being eaten by a polar bear. I wanted to scream at her for putting me on the spot. What a terrible decision to have to make. This photographer probably acted on his instincts to just shoot. He will no doubt be haunted by the image-not only by the money he made from it but more so the reactions it brought. I personally find it in poor taste on the part of the NY Post, and I sympathize with the photographer for being in that wrong place at that wrong time – even if he was looking for a story. 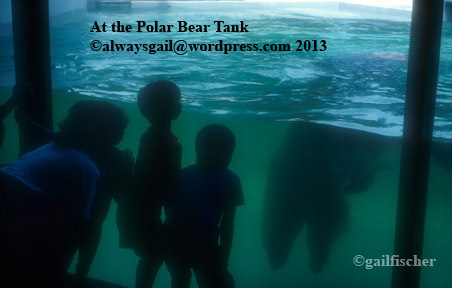 The question I now ask myself, “Why didn’t he jump into the polar bear tank?” I think I know the answer. Image | This entry was posted in Animals, food for thought, memories, News stories, People and Places and tagged daughter, doomed man, doubts, haunting, image, jump, NY Post, photographer, polar bear, questions, RXR tracks, save a life, subway, take action, zoo. Bookmark the permalink.